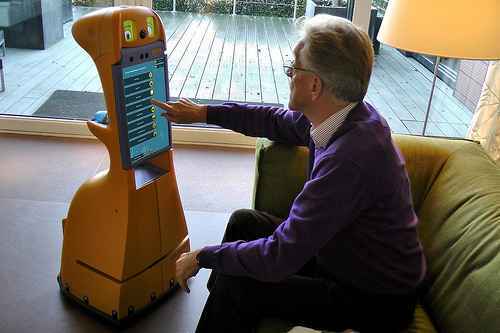 "The developed care robot acts as a coach and companion, and supports the user by means of suggestions, encouragements and reminders on a physical, cognitive and social level. Think about offering structure by eating and drinking suggestions and medicines reminders, proposing activities such as going for a walk, playing a game, or calling someone, and reminding about appointments and tasks. It is expected that this will contribute to a more active, enjoyable and healthier life, not only for the end-user, but also for the partner or social carer. The robot can be considered as an helping hand for both." A series of two-day live-in tests put Hector and real MCI patients together. So far all patients accepted the robot and found it helpful, even those who initially found it scary (which is understandable given that the robot is equipped with moving eyes that seem to serve no purpose but to make it look creepy). The tests also uncovered many aspect of the robot that still need improvement before it can be deployed for real. After the break, see video of Hector in action as well as video of an earlier prototype of the CompanionAble robot.